I haven't made a pot pie since I made my very first meal from scratch the summer after my freshman year in college. 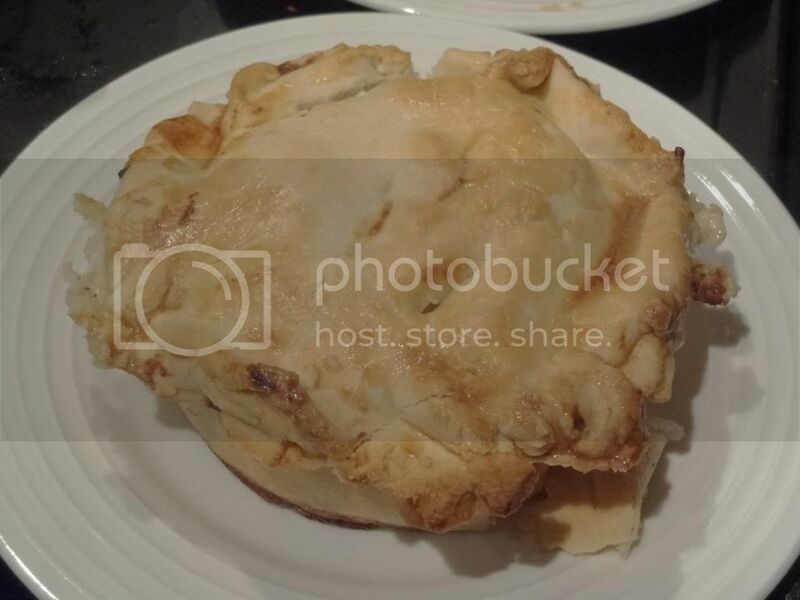 That pot pie used Bisquick for the pie crust, limp vegetables that had been hanging around in the veggie drawer for too long, and a cream of something soup. I think it was this recipe, which despite the ingredients I used was rather tasty. 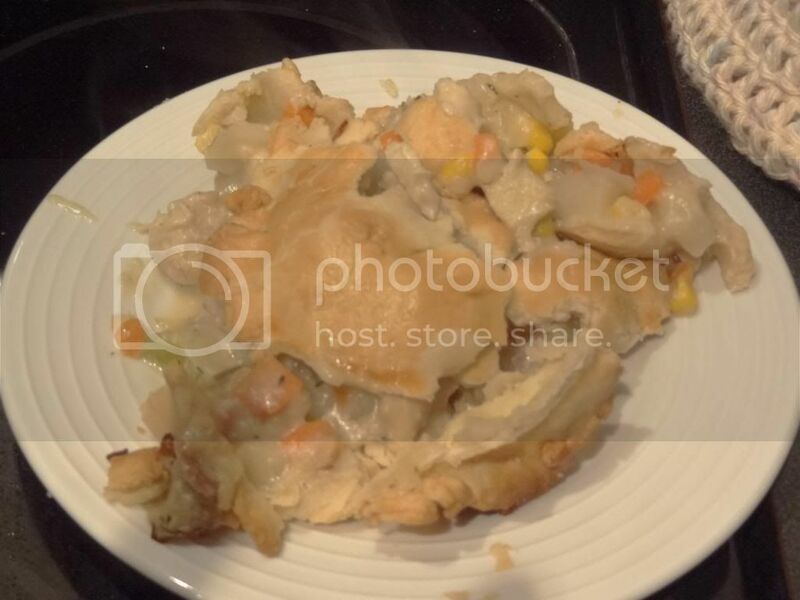 I've come a long way since then but have never made another chicken pot pie. Last Thanksgiving, I had collected a number of recipes hoping to make pot pies with turkey leftovers. Then I ran out of leftovers without ever making the pies. 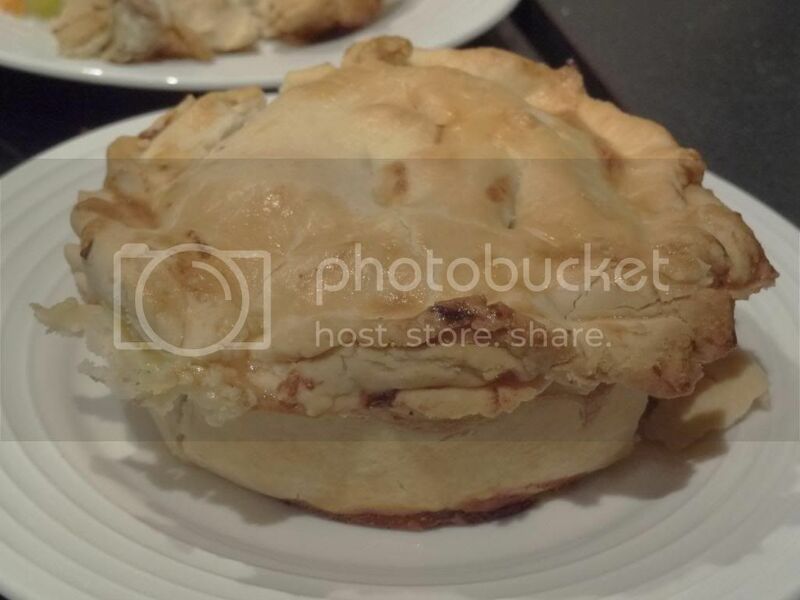 Fast forward nearly a year and finally I made pot pies with chicken. Tonight, I plan on making another using turkey leftovers. I worked off of this recipe from the Baker Chick, although I had to fill in the spice gaps myself and switched up some of the veggies. What I like especially about this recipe is that it contemplates using uncooked chicken rather than leftover meat so you can make it anytime assuming you're like me and always keep boneless skinless chicken breasts in the freezer. You can also use cooked meat and add it at the end. Other than being incredibly sloppy because I had a screaming baby being thrust in my face every 2 seconds by my darling husband as I was trying to roll and shape the crusts, these turned out wonderfully. 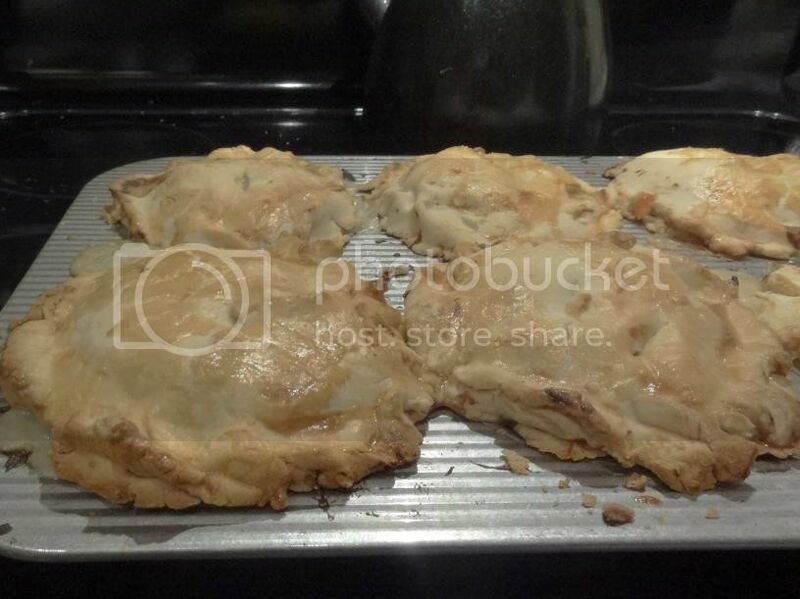 I used a deep large muffin pan to make cute individual pies, although you could certain make one large pie. Using a pastry cutter or in the bowl of a food processor, combine flour and salt. Cut in or pulse butter until mixture resembles coarse crumbs. Add in ice water a tablespoon at a time until the dough holds together without being wet or sticky. Turn out dough onto a floured work surface. Divide in thirds and flatten into disks. Wrap in plastic, and refrigerate at least 1 hour or overnight. In a saucepan, combine chicken, carrots, and potatoes. Add enough chicken broth cover and boil for 15 minutes. Remove from heat, drain (while saving the chicken broth,) and set aside. Stir in flour, salt, pepper, and spices. Slowly stir in 1 3/4 cup chicken broth and milk. Simmer over medium-low heat until thickened. Gently stir in chicken, potatoes, and corn (and peas, if using). Each 3rd of dough yields 4 dough rounds. Roll each dough circle out until it is big enough to be pressed into the muffin tin with a half inch over hang. Ready 6. Generously spoon filling into each bottom layer of dough--you want it to dome. Top layer with other layer of dough. Trim excess and press to seal with tines of a fork. Brush with an egg wash and cut a few slits in the top of the pie to allow steam to escape. Bake at 425 for 30 minutes, or until pies are crisp on top and golden brown. Though they weren't the prettiest, they were definitely yummy. Even the one that fell apart.